Microblading for the eyebrows is the manual process of introducing semi-permanent makeup in the form of colored pigments just down to the dermis. It is done using a hand tool with a very fine blade to mimic hair on the brow area. Because we’re inserting color closer to the surface, the strokes appear crisp and very fine. This method is ideal for anyone wanting to enhance the look of their eyebrows. The results are a natural, fuller brow that can last anywhere from 1-3 years, depending on different factors affecting the procedure. Microblading is a two step process consisting of the initial procedure and complimentary touch-up performed 4-8 weeks later. The results can last up to three years, however, an annual touch-up is highly recommended in order to keep your brows fresh, and ensure the pigment and shape is retained. Please read all information carefully before booking an appointment. And contact us with any questions! 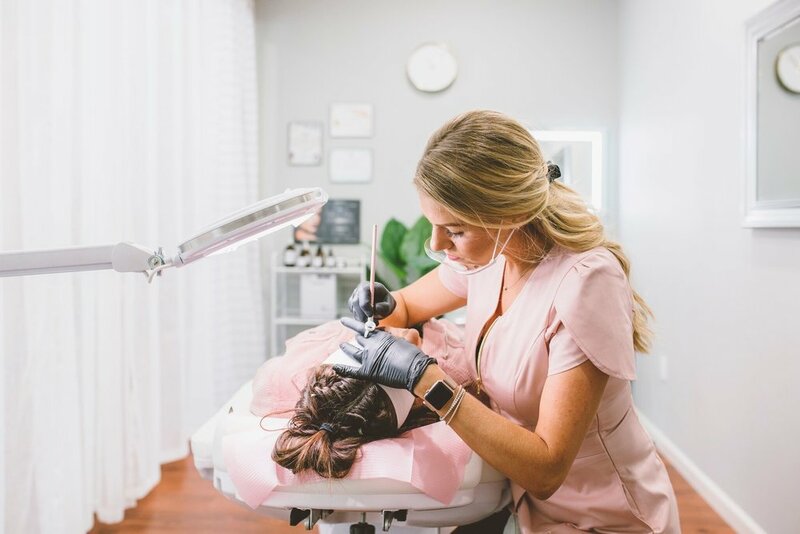 Find out if Microblading is right for you! We highly recommend coming in for a free consult so that we can answer any questions you might have and rule out any contraindications. We will discuss your brow goals and expectations as well as map out your ideal shape. Microblading is a two-step process. A 6-8 week touch-up or "enhancement session" is included, where we will perfect the shape, color, and density of the brows. Combining microblading strokes with soft shading helps create more density in the brow, and more coverage of selected areas. It is a great option for covering up old faded tattooed brows, or the perfect add-on for a fuller more filled-in look. (2-6 months after initial 6 wk touch-up.) Can be necessary for oily or difficult skin types or anyone wanting to keep their brows on point! (7-18 months after the 6 week touch-up) Please review and follow the pre & post-care instructions prior to this appointment. This is a color boost or annual touch-up on microbladed brows not previously done by an artist at Primp. *Price is a starting point. Fifty percent of the outcome of your microbladed brows is dependent upon proper aftercare. In order for your new brows to heal properly (and look their best) these Pre & Post Care Instructions found below are of the UTMOST IMPORTANCE. Avoid Fish Oil, Prenatal Vitamins, Nutritional Shakes (Shakeology, etc), and "Hair, Skin, & Nail" supplements two weeks prior to procedure. No brow waxing, tinting, henna or threading one week prior to the appointment. The more natural hair growth you have, the better actually! No microdermabrasion or laser or chemical peels four weeks prior. Discontinue Retin-A, Alpha Hydroxy Acid (AHA), and any chemical exfoliant or “brightening” skincare at least 4 weeks prior. Do not use AHA, or any chemical exfoliant or “brightening” skincare products close to the eyebrow area 2 weeks prior to and 2 weeks after your procedure as these can prematurely fade the microbladed brows. Please Note: You will be more sensitive during your menstrual cycle. These Pre-Care instructions are designed to limit bleeding and skin sensitivities during the service. Excessive bleeding during the procedure will dilute the pigment and can lead to poor results! Do not touch brows or surrounding area for 24 hours. Treat your microbladed brows like an open wound. After 24 hours keep the brow area clean by using a gentle fragrance-free cleanser and water with freshly washed hands morning and night (2x/day). Do not use a washcloth or sponge and clean area by moving in the direction of the hair growth. Allow eyebrows to air dry before applying a thin layer of Primp's special aftercare serum. Avoid sun exposure, tanning beds, pool (chlorine is irritating), sauna, steam rooms, hot showers and/or hot baths for 3 weeks. NO makeup or skincare products to be used on the treated area (forehead and brows) for two weeks. Avoid Retin-A close to brow area. Please note: Immediately following your procedure, the brows will appear up to 20-40% darker and bolder in color and up to 15% thicker than they will be once they are healed. The brow area may feel a bit like sunburn immediately afterwards, but expect minimal discomfort overall. During the initial healing period, the brows will go through various stages, and some scabbing or flaking of the skin may occur. If scabbing or flaking is present, do not pick the scabs or dry skin; allow the scab or dry skin to flake off on its own to avoid pulling the pigment off prematurely. The complete healing process takes about 6-8 weeks, at which time the true color of the tattoo is evident. During this process, your tattoo will soften and lighten before your skin naturally exfoliates revealing the pigment that has been deposited. Wait at least 6 weeks to see the true color and shape represented. Refer to the photos of the healing stages on the card in your aftercare kit at this time. It can be a bit of a roller coaster, so just trust the process and be patient. A routine touch up, or adjustment if needed, (which is INCLUDED in the initial cost) is recommended after 6-8 weeks when we will assess the healed strokes, and add any detail or make changes to color and shape at this time. I promise it is all worth it!